For several decades, addiction has come to be viewed as a disorder of the dopamine neurotransmitter system; however, this view has not led to new treatments. Numerous studies suggest that stimulants increase striatal dopamine levels and some evidence that alcohol may have such an effect. Past studies also show that striatal dopamine receptor availability and dopamine release are diminished in individuals with stimulant or alcohol dependence and not in individuals with opiate, nicotine or cannabis dependence. Thus, this area of the brain is a target of many addiction studies around the world. Now, a study from researchers at the Texas A&M Health Science Center College of Medicine and University of California San Francisco shows that alcohol consumption alters the structure and function of neurons in the dorsomedial striatum, a part of the brain known to be important in goal-driven behaviours. The new study shows that the dopamine D1 receptor plays an important role in addiction. The team states that the findings could be an important step toward creation of a drug to combat alcoholism. Previous studies show that these neurons can be thought of like a tree, with many branches, and many small protrusions, or spines, coming off of them. They each have one of two types of dopamine receptors, D1 or D2, and so can be thought of as either D1 or D2 neurons. D1 neurons are informally called part of a ‘go’ pathway in the brain, while D2 neurons are in the ‘no-go’ pathway. In other words, when D2 neurons are activated, they discourage action telling the person to wait, to stop, to do nothing. 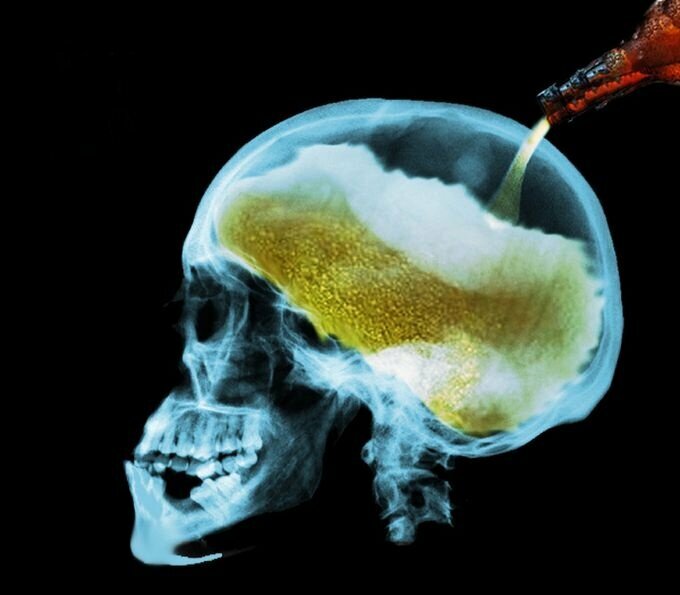 The researchers state that their study found that periodic consumption of large amounts of alcohol acts on D1 neurons, making them much more excitable, which means that they activate with less stimulation. The current study used an animal model to determine that alcohol actually changes the physical structure of medium spiny neurons, the main type of cell in the striatum. Results showed that when these neurons are excited, the person will want to drink alcohol or have a craving. Data findings show that when neurons with D1 receptors are activated, they compel the person to perform an action, reaching for another bottle of tequila, in this case. The lab states that this then creates a cycle, where drinking causes easier activation, and activation causes more drinking. Findings suggest that these changes in activation of D1 neurons might be related to the physical changes happening at the sub-cellular level in brains that have been exposed to alcohol. The current study showed that they have longer branching and more of the mature, mushroom-shaped spines, the type that stores long-term memories, than their abstaining counterparts. The placebo group in the current study were not exposed to alcohol and were shown to have more of the immature versions of the mushroom-shaped spines in D1 neurons of their brains. Results show that the total number of spines didn’t change in the two groups, however, the ratio between mature and immature was dramatically different between the alcohol group and the placebo group. The researchers state that this has important implications for memory and learning in drug addiction. The lab explain that when a person drinks alcohol, long-term memory is enhanced, in a way, however, this memory process is not useful as it underlies addiction since it affects the ‘go’ neurons. They go on to add that as there was no difference in the number of each type of spine in the D2 (no-go) neurons of alcohol-consuming and control models, it was observed that there was a specific relationship between D1 neurons and alcohol consumption. On further investigation the alcohol-consuming animal models with the increased mature spines in D1 neurons also showed an increased preference to drink large quantities of alcohol when given the choice. Data findings show that even though they’re small, D1 receptors are essential for alcohol consumption. Results show that when those same animal models were given a drug to at least partially block the D1 receptor, they showed much-reduced desire to drink alcohol. However, it was shown that a drug that inhibited the D2 dopamine receptors had no effect. The team hypothesize that if this activity is suppressed then alcohol consumption is suppressed. They go on to conclude that the global medical community can use these findings to develop a specific treatment targeting these neurons. For the future the group state that their ultimate goal is to understand how the addicted brain works and when they do, they’ll be able to suppress the craving for another round of drinks and ultimately, stop the cycle of alcoholism.